The BEN domain is found in diverse animal proteins such as BANP/SMAR1, NAC1 and the Drosophila mod(mdg4) isoform C, in the chordopoxvirus virosomal protein E5R and in several proteins of polydnaviruses. Computational analysis suggests that the BEN domain mediates protein-DNA and protein-protein interactions during chromatin organisation and transcription. SMAR1 (Scaffold/Matrix attachment region-binding protein 1; also known as BANP), a tumour-suppressor MAR-binding protein that down-regulates Cyclin D1 expression by recruiting HDAC1-mSin3A co-repressor complex at Cyclin D1 promoter locus; SMAR1 is the target of prostaglandin A2 (PGA2) induced growth arrest [(PUBMED:16166625), (PUBMED:17726044)]. NAC1, a novel member of the POZ/BTB (Pox virus and Zinc finger/Bric-a-bracTramtrack Broad complex), but which varies from other proteins of this class in that it lacks the characteristic DNA-binding motif [(PUBMED:17945361)]. Mod(mdg4) isoform C, the modifier of the mdg4 locus in Drosophila melanogaster (Fruit fly), where mdg4 encodes chromatin proteins which are involved in position effect variegation, establishment of chromatin boundaries, nerve path finding, meiotic chromosome pairing and apoptosis [(PUBMED:15094203)]. Trans-splicing of Mod(mdg4) produces at least 26 transcripts. 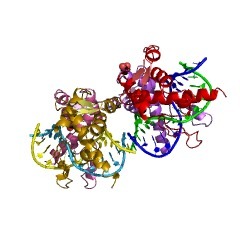 E5R protein from Chordopoxvirus virosomes, which is found in cytoplasmic sites of viral DNA replication [(PUBMED:10854161)]. The BEN domain is predicted to function as an adaptor for the higher-order structuring of chromatin, and recruitment of chromatin modifying factors in transcriptional regulation. It has been suggested to mediate protein-DNA and protein-protein interactions during chromatin organisation and transcription. The presence of BEN domains in a poxviral early virosomal protein and in polydnaviral proteins also suggests a possible role in the organisation of viral DNA during replication or transcription. They are generally linked to other globular domains with functions related to transcriptional regulation and chromatin structure, such as BTB, C4DM, and C2H2 fingers [(PUBMED:18203771)]. 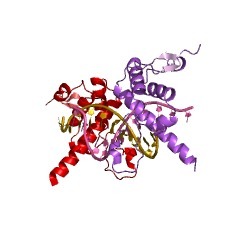 This domain is predicted to form an all-alpha fold with four conserved helices. Its conservation pattern reveals several conserved residues, most of which have hydrophobic side-chains and are likely to stabilise the fold through helix-helix packing [(PUBMED:18203771)]. There are 4949 BEN domains in 3834 proteins in SMART's nrdb database. Taxonomic distribution of proteins containing BEN domain. This tree includes only several representative species. The complete taxonomic breakdown of all proteins with BEN domain is also avaliable. Click on the protein counts, or double click on taxonomic names to display all proteins containing BEN domain in the selected taxonomic class. We report a previously uncharacterized alpha-helical module, the BENdomain, in diverse animal proteins such as BANP/SMAR1, NAC1 and theDrosophila mod(mdg4) isoform C, in the chordopoxvirus virosomal proteinE5R and in several proteins of polydnaviruses. Contextual analysissuggests that the BEN domain mediates protein-DNA and protein-proteininteractions during chromatin organization and transcription. The presenceof BEN domains in a poxviral early virosomal protein and in polydnaviralproteins also suggests a possible role for them in organization of viralDNA during replication or transcription.